We wanted to remind everyone about the book giveaway this month. Three winners will receive 4 books each. To enter, all you need to do is start a thread in the forum and get anyone else here at SI to comment on it. Details on the contest are here. 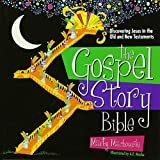 One of the books to be won is The Gospel Story Bible, and so I thought we could take this opportunity to learn more about this excellent resource. Motherhood teaches women the imagery and language of the gospel on an intensely personal level. Read more about Motherhood teaches women the imagery and language of the gospel on an intensely personal level. Where Have All the Children Gone in Your Church? Read more about Where Have All the Children Gone in Your Church? Science is now speaking up, with a voice that could spell the end... for the insidious practice of showering schoolchildren with empty praise. “Sam’s Club received numerous concerns from our members and parents about the mature content in what is perceived as a children’s book. "Only 46 percent of children in the United States will reach age 17 having grown up in a home with biological parents who are married"
Read more about "Only 46 percent of children in the United States will reach age 17 having grown up in a home with biological parents who are married"